Britain declared war on Germany at 11 pm on the 4th of August 1914. War continued until 1918 when the armistice was signed. By the end of the war nearly 10 million people had died, almost twice that of World War Two. As well as the British and Germans the French, Canadians, Australians and Americans were involved. In Britain shortages meant rationing was introduced towards the end of the war. Food was imported from America and Canada but the German U-boat was causing big losses to shipping in the Atlantic. By April 1916 Britain had only six weeks of wheat left and bread was a staple part of most people’s diets. This was the first time the war really came home to most families. Any area that could grow food was converted to do so – gardens were turned into allotments to grow food, keep chickens etc. The government itself took over 2.5 million acres of land for farming. The First World War is also called the Great War because of the extensive damage and impact it left on the world after its cessation. Amongst all the wars which have occurred since the 19th century, only WW1 has been as far-reaching in damage, not only physically but mentally to citizens of countries involved in the war. It was more commonly known as the Great War until the outbreak of the far greater Second World War made the distinction necessary. This is a summary of the events of the Eye Patriotic Association and the villagers of Eye during the great war taken from the book; The Souvenir Book of Eye. You can view a full copy of the ‘The Souvenir Book of Eye’ here. Later came the Belgian relief committee and the committee for entertainment. 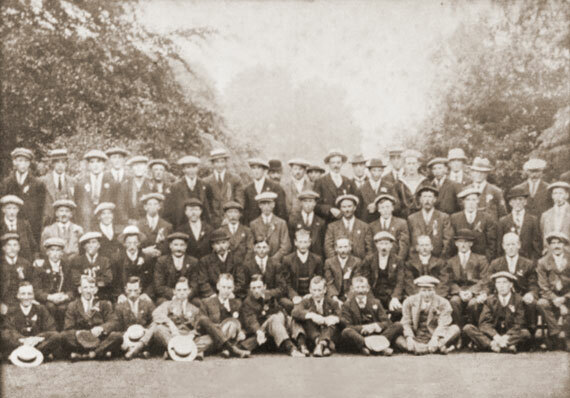 During the first year the association raised recruits, raised money for the Prince of Wales fund and Red Cross and provided for a family of Belgian refugees. 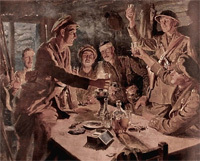 At a recruiting meeting on September 2 1914, the names of 14 volunteers were given to an army major at a meeting of the association, the recruits were then given a farewell supper at the Blue Boar. 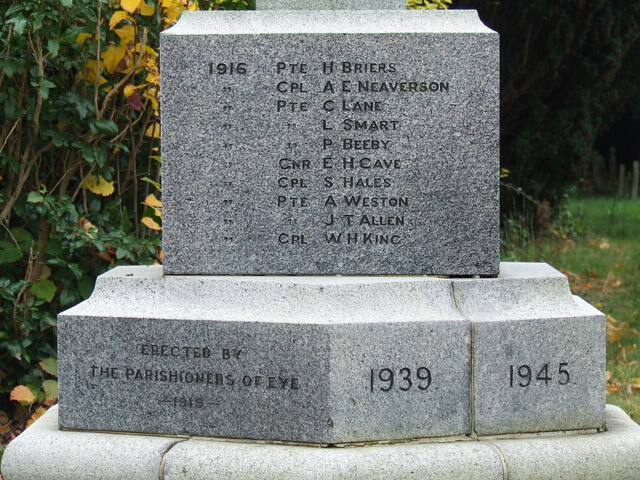 Their names were; Herbert Briers, Fred Broughton, Fred Dighton, Thomas Hales, Percy King, Cecil Lane, Albert Neaverson, George Perkins, Leonard Southwell, Lewis Steels, George Spires, Arthur Taylor, William, and Edward Whittamore. 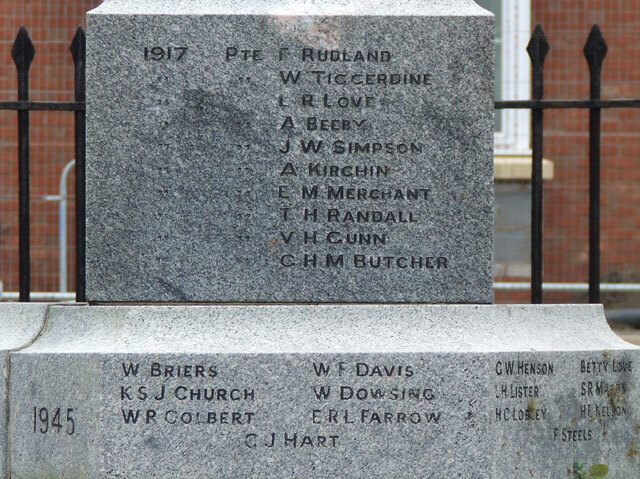 Sadly five of these boys gave their lives for their country. In 1914 a Belgian refugee family was housed in the village and the cost of their maintenance was met by a monthly subscription collected from around the village by the boy scouts. The story goes that work was found for the father at the brickyards and the mother and daughter were supplied materials so they could make lace bobbins etc and sell them. By 1915 they were earning enough to live on and the committee felt the time right to remove the charitable support with the exception that the family still lived in the house rent-free. At this the father ‘got the wind up’ as they would say and said his family would leave the village. Every effort was made to change his mind but it did no good. The whole family left and went back to London. “A very sad ending to what was a very promising beginning and a great disappointment to those that worked so hard for them.” this quote says it all really. A roll of honour, a permanent record of those that contributed, was drawn up to raise funds for a New Year Gift to our boys £44/12/½ was raised with 8/- going to each of the boys. A War Shrine was erected outside the iron room. The iron room was built of corrugated iron and dated back to 1895. Throughout the years of the war flag days were held. Small flags were made and sold, often in the colours of a particular country who would receive the funds. Flag days where held throughout the year. As you can see in the table from 1917 below the good causes varied enormously but the generosity of villagers never stopped. Fundraising continued, the New Years gift fund exceeded all records at £96/2/6, children collected £8/10/8 and Mrs Field’s rummage sale made £33/5/10. November 11th 1918 the war ended. News reached Eye about 11 am and the church bells rang from that time until about 4 pm. Flags and bunting appeared all across the village in celebration. Special services were held at the church. At a meeting of the Eye Patriotic Association held in the Iron room, Dec 5th 1918 it was resolved that a Souvenir Book would be compiled to take account of the doings of the Patriotic Society..
On March the 8th a branch of the National Federation of Discharged and Demobilised Sailors and Soldiers was formed in Eye and thanked the Eye Patriotic Association for their noble effort in supporting them during the war. 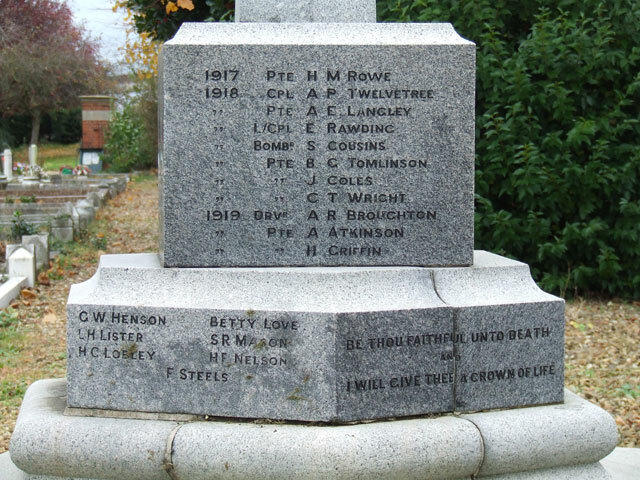 At a public meeting on April 10 it was resolved that the balance in hand of £72/10/7 would be reserved for a Souvenir Book for the boys and a memorial would be erected in the Cemetery containing the names of all those from Eye that had died in the war. 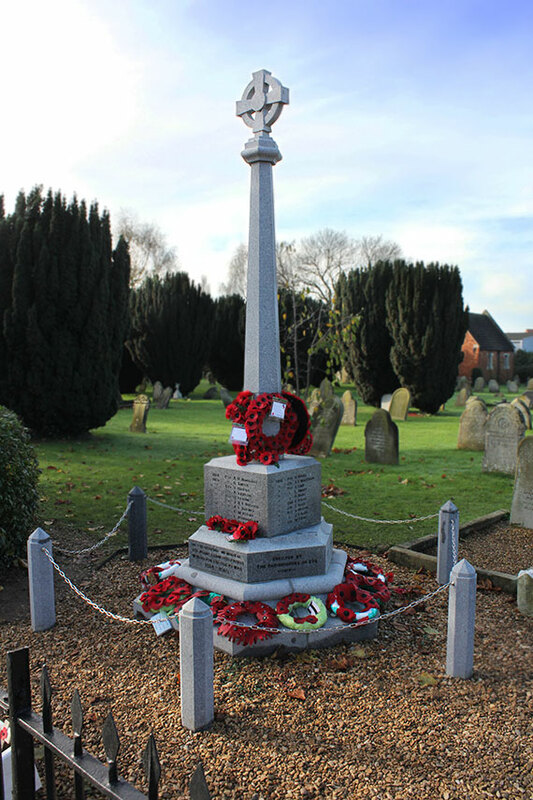 In the end the association raised nearly £500 for war memorials. 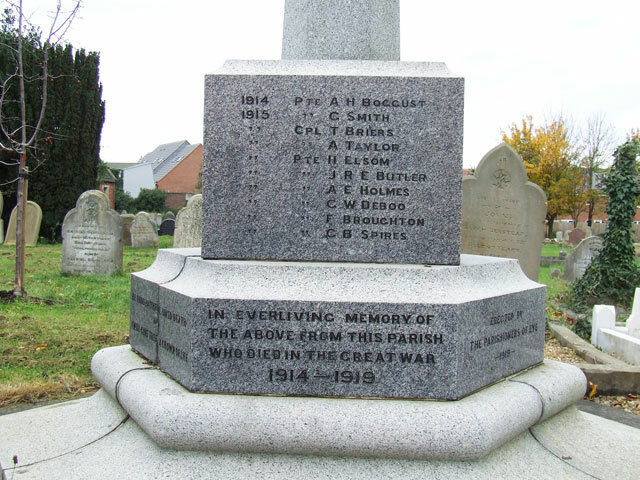 The church memorial was dedicated at a special service on Wednesday November 26th 1919 at 8 pm. The final meeting of the Eye Patriotic Society was held on Thursday April 8th 1919 in the School. The total amount given by the parishioners of Eye was £2929/1/0, about £180,000 in today’s money. An oak tree was planted in the grounds of Aldermans W. G. Moore JP. An ornamental fence and tablet were ordered in commemoration of the peace and in appreciation of the kindness and public service rendered to the parish during the war. If you require more detail you need to read the The Souvenir Book of Eye, being some records of The Great War, 1914 – 1919 by the Rev. Lawrence P. Field, M.A., vicar of Eye, and Hon. Sec. Of the Eye Patriotic Association. Available from the archives of Peterborough Central Library. 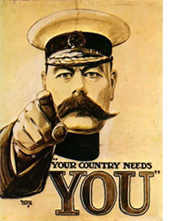 Hello I am researching for my colleagues who served in in the great war first or second. I have got there names only, I want to find out who these men were and hopefully find their photos. Could you please help me to let me know how and where I could find this information. Many thanks Jasbir Singh.